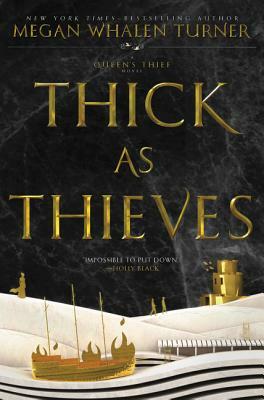 Thick as Thieves is the eagerly anticipated new stand-alone novel set in the world of the Queen’s Thief. New York Times-bestselling author Megan Whalen Turner’s entrancing and award-winning Queen’s Thief novels bring to life the world of the epics and feature one of the most charismatic and incorrigible characters of fiction, Eugenides the thief. Megan Whalen Turner’s Queen’s Thief novels are rich with political machinations and intrigue, battles lost and won, dangerous journeys, divine intervention, power, passion, revenge, and deception. Perfect for fans of Leigh Bardugo, Marie Lu, Patrick Rothfuss, and George R. R. Martin. Kamet, a secretary and slave to his Mede master, has the ambition and the means to become one of the most powerful people in the Empire. But with a whispered warning the future he envisioned is wrenched away, and he is forced onto a very different path. Set in the world of the Queen’s Thief, this epic adventure sees an ordinary hero take on an extraordinary mission. The Queen’s Thief novels have been praised by writers, critics, reviewers, and fans, and have been honored with glowing reviews, “best of” citations, and numerous awards, including the Los Angeles Times Book Prize, a Newbery Honor, the Andre Norton Award shortlist, and the Mythopoeic Fantasy Award. Discover and rediscover the stand-alone companion stories The Thief, The Queen of Attolia, The King of Attolia, and A Conspiracy of Kings, all epic novels set in the world of the Queen’s Thief. Thick as Thieves includes two maps, a map of the world of the Queen’s Thief, and a map of Kamet’s journey. New York Times–bestselling author Megan Whalen Turner is the award-winning author of six novels set in the world of the Queen’s Thief. These epic novels of intrigue and adventure can be read in any order, but were published as follows: The Thief, The Queen of Attolia, The King of Attolia, A Conspiracy of Kings, Thick as Thieves, and Return of the Thief. Megan Whalen Turner has been awarded a Newbery Honor and a Boston Globe-Horn Book Honor and won the Los Angeles Times Book Prize for Young Adult Literature. She has won the Mythopoeic Fantasy Award for Children’s Literature and was a finalist for the Andre Norton Award. She worked as a bookseller for seven years before she started writing. Her first book was a collection of short stories called Instead of Three Wishes.